Contract talks wrapped up Friday and were set to continue on Saturday. Striking teachers and the nation's second-largest school district are set to continue renewed negotiations Saturday following a fifth day of passionate protests in Los Angeles. Mayor Eric Garcetti tweeted that talks ended without a deal between a teachers' union and the Los Angeles Unified School District just after 9 p.m. Friday. The two sides "had a second productive day of contract negotiations" and will continue their discussions at Garcetti's office Saturday morning, he posted. Teachers picketed and rallied in a fifth day of strikes against the giant school district on Friday. Drums, whistles, shouts and honks from supportive drivers echoed through downtown as groups of teachers and backers walked to a rally that drew thousands outside City Hall. Union President Alex Caputo-Pearl vowed to outlast the school district during the rally, which got a boost from celebrity speakers and performers including musician Aloe Blacc and actor Sean Astin. District Superintendent Austin Beutner expressed hope for an imminent end to the impasse. "Too many students are missing out on the education they should be getting," he said. "We need to solve this now and get our educators and all of our students back in the classroom." But "we can't solve 40 years of underinvestment in public education in just one week or just one contract," he added. "And we can't fix these problems working separately. We have to do it together." Renewed negotiations organized by Garcetti's office began Thursday afternoon and didn't break until after midnight. The mayor does not have authority over the district, but he has sought to help both sides reach an agreement. Caputo-Pearl earlier tempered expectations for an immediate resolution, noting that bargaining had gone on for 21 months before the strike and key differences remained. Clashes over pay, class sizes and support-staff levels in the district with 640,000 students led to its first strike in 30 years and prompted the staffing of classrooms with substitute teachers and administrators. Parents and children have joined the protests despite heavy rain that drenched the city. Overall school attendance fell to 85,274 students on Friday, or 13 percent of the student population. With state funding dependent on attendance, student absences have cost the district about $125 million over five days, the district said. At the same time, it doesn't have to spend about $10 million a day on teacher pay. "There've been a lot of sleepless nights and hard days during this strike," Beutner said. "It has not been easy on anyone. That said, I remain optimistic about our ability to work together to find creative solutions to solve these long-term problems." The union representing principals urged the district to close schools until the strike is over. If it can't close the campuses, Associated Administrators of Los Angeles asked for additional resources for principals who have helped keep schools running while teachers walk picket lines. In response, Beutner acknowledged the administrators' sacrifices but said schools must remain open to provide a safe place for students. 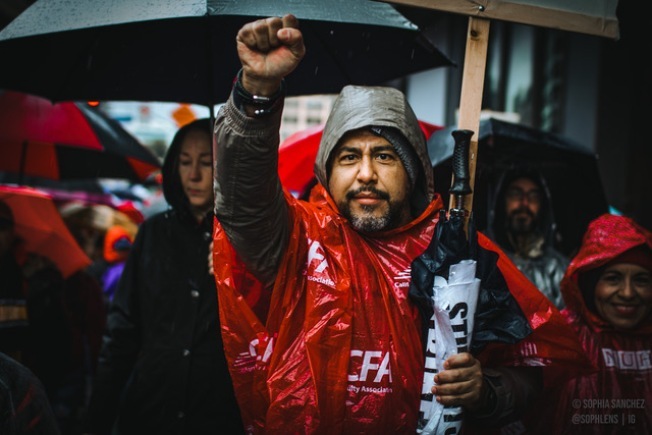 All 1,240 K-12 schools in the district have remained open, a departure from successful strikes in other states that emboldened the Los Angeles union to act. The union rejected the district's latest offer to hire nearly 1,200 teachers, counselors, nurses and librarians and to reduce class sizes by two students. It also included a previously proposed 6 percent raise over the first two years of a three-year contract. The union wants a 6.5 percent hike at the start of a two-year contract. District officials have said teacher demands could bankrupt the school system. Beutner has urged the teachers to join him in pushing for more funding from the state, which provides 90 percent of the district's money. AP reporter Christopher Weber contributed to this report.